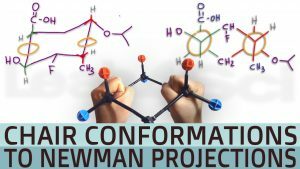 This video walks you through the Chair Conformations Practice Quiz bonus question B – Converting a cyclohexane chair conformation to double Newman Projections. Practice is ESSENTIAL to mastering Organic Chemistry. You have to be able to apply the skills you are learning. First, complete the Cyclohexane Chair Conformations Practice Quiz, and then watch this video where I go over the Challenge Question part B solution and explanation step-by-step! Try the Chair Conformation Practice Quiz! This is video 2 in the Chair Conformations Tutorial Series. Thank you so much. These videos are clear and precise. I’m a visual learner so can’t tell you how much you’ve helped me! So glad to hear that, Nida! Glad to help!